Dolphin Boatyard, situated in Galmpton Creek on the river Dart, has not changed hands too many times over the years. The first recorded sale was from the Duchy of Cornwall to W. Hall in 1850, Mr Hall having been a tenant of the Duchy for a number of years before that time. When Mr William Hall retired the yard passed to his nephew, S. B. 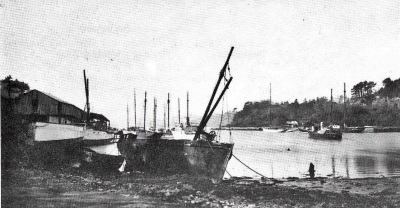 Hall in 1924 and Hall’s Shipyard became a hive of industry. There were boatyards on both sides of the creek namely Gibbs and Halls. Both turning out the traditional mule stern trawlers for the Brixham Fishing Fleet, as well individual craft. The yards built some 300 plus trawlers between them over a 100 year period. During the World War II years, both yards were pressed into service to build craft for Coastal Forces. 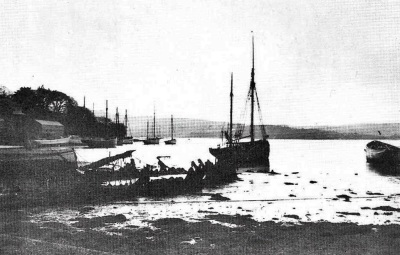 Gibbs/Sanders yard coming under the management of Curtis of Looe, who had also taken over the boat building at Totnes, whilst Hall’s Shipyard was given the responsibility of managing their own team. S.B. Hall must have worked around the clock as records show that, during the period, they built and launched 6 MGB’s (Motor Gun Boats) 6 MTB’s (Motor Torpedo Boats, 4 Fairmile B ML’s (Motor Launches), 3 Wartime MFV’s (Armed Fishing Boats) and 4 HSL’s (High Speed Launches). The build time being 8 weeks on average utilising the two undercover slips in existence at that time and two grids. 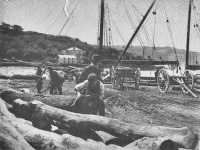 In between building the yard was also responsible for general repairs of craft stationed at Dartmouth. Mr Hall retired in 1956 when the yard was sold to John Perrett and renamed the Dolphin Boatyard. It stayed in the same family ownership until 2014 when ill health forced another sale. The new owner is Ben Morris and it is his aim to restore the yard to its former glory.